Do you remember the magic of summertime in your youth? Do you remember how bright the sun was or how blue the sky was back then? I remember. Somewhere between the walks home from the baseball park through the cemetery and my first car/first girlfriend, I seemed to have misplaced that magic, though. I wish I could find it again; maybe when my second childhood starts and I revert all the way back to messing in my diapers (Depend®) again. 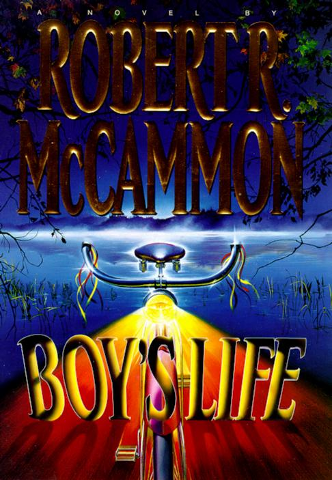 If you’ve forgotten the magic, then maybe you should pick up a copy of Robert R. McCammon‘s Boy’s Life. It will go a long way to reawakening that magic for you. If you were a child of the 50s or 60s as I was, you’ll be taken along for a ride by McCammon that won’t be too very unfamiliar to you at all. Sure, the settings might be bit different (Alabama in the book) than those you remember, but they’ll be eerily familiar. McCammon did not lose the magic when he aged. If he did, he was definitely able to conjure it once again to write this story. Or maybe writers just never lose that magic. Who knows? Boy’s Life is a story about a boy. How ’bout that, huh? His name is Cory. He’s 12 years old in the summer of 1964. A year removed from a tumultuous 1963 and a few years prior to latter historical events like Tet of ’68, Watergate, and the Summer of Love (’69). From Spring through to that year’s waning days, young Cory narrates his adventures growing up in the small town of Zephyr on the Tecumseh River in southern Alabama. The events and the tragedies and the strangeness all whirl around one another weaving a story filled with that pure and simple magic of youth. You’ll meet characters who seem oddly familiar. You’ve met them in your own lives, in your own hometowns, in your own eras. They’re common to everyone, I think. You’ll learn a bit of history while reading this book. It’s OK, though. It won’t hurt you none. If you didn’t know anything about the Civil War, the Wild West, dinosaurs, WWII, the Nazis, the Holocaust, etc., Cory’s telling of related events in his own childhood may lead you to the library to do a bit of research on these things. That’s a good thing. I have a couple favorite “coming of age” type books: Stephen King’s IT and Dan Simmons’ Summer of Night. Both authors manage to bring back the magic long gone from my soul whilst reading these works. I think that’s why they both left lasting impressions on me. Anything that revives the magic is a good thing. There’s so little magic in adult life, sadly. This would be a great book to curl up by the fire with one of these dark, cold winter nights. Oh, and you won’t have to be a boy to appreciate it. Little girls had a magic all their own. They’ll understand, too. That’s it for now, folks. Stop being so busy. Get yourself a good book and sit down and read awhile. It’s a magic that we can still enjoy at any age. Posted by V. T. Eric Layton on 10 January 2015 in Books and Literature and tagged Boy's Life, coming of age, horror, magic, mystery, review, Robert R. McCammon. For women, “The Reason for Roses” by Babs H. Deal is the same sort of thing. Written in the mid-1970s and unfortunately out of print now, as are most of her books, it also takes place in Alabama, but during the late 1930s. Small town childhoods didn’t change so much in 20 years that I couldn’t identify with her character, Spencer. I loved this book and it was one of my favorites in 2014, even though I grew up in the 60s/70s and am female. The audiobook edition is marvelous, too — for anyone who likes audiobooks. Very nice review, I do not know how I missed this one. Anyway, the book sounds like it is very good and I will probably snag me a copy to read.